This built-in trash compactor makes it easy to dispose of trash and recyclables. The SOLID PACK Control makes sure everything's packed and reduces trash volume by up to 80%. The odor management system, the trash compactor helps keep your kitchen odor free. Plus, this trash compactor is designed, engineered and assembled in the USA. I have an existing cut out of 14 15/16&quot;. Is this unit exactly 15&quot; or is just a little under that? They say you need 15 1/4&quot; and I trimmed to that dimension. I have about 1/8 of an inch on each side. 15 inches might work but I found having the 1/4 inch extra helps you with room you need to level the unit. what are the dimensions (how tall is it)? Hello Per! The height on this model is: 34 1/2&quot;. Thank you for your inquiry on our Maytag appliances. Are the sides of this unit finished? Some built-in models come with the sides unfinished. My current unit that I am replacing is not built in so the sides are exposed and therefore the sides need to be finished on the replacement I choose. No the sides, and the top aren't finished. When you build something in it usually means, covers all around the sides, top and back. How to order accessory kit needed to install under counter? 15 in. 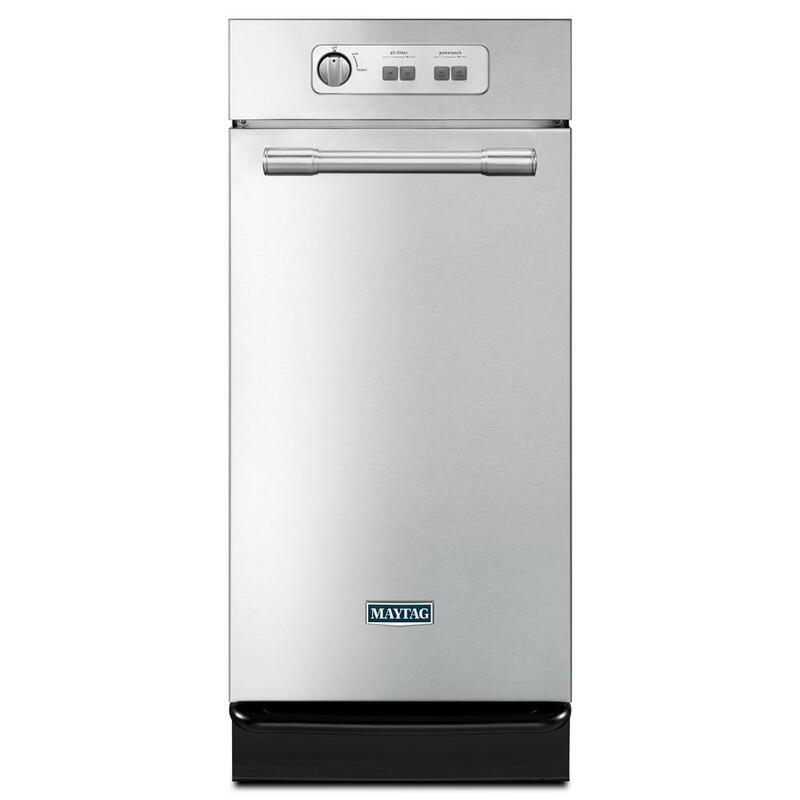 Built-In Trash Compactor in Monochromatic Stainless Steel is rated 4.0 out of 5 by 24. Rated 5 out of 5 by Bill from The Maytag trash compactor is exactly what we expected... our old home had a Whirlpool compactor,... The Maytag trash compactor is exactly what we expected... our old home had a Whirlpool compactor, and after moving we found we missed having our trash compactor. So after shopping around we found the Maytag (also manufactured by Whirlpool) on sale at the Home Depot. The cabinet containing our trash cans came out easily, and the compactor slid right into that spot. Rated 1 out of 5 by John from After installing the unit per the directions in the book... After installing the unit per the directions in the book the door did not line up with the frame. We took it out checked and shimmed the floor then reinstalled the unit and the slide in unit still did not line up with the frame. We called the help line and they put us in touch with Unimaster, Inc. to come out to the house and see if they remedy the problem on warranty since it is a new unit and we have not heard back from them since their investigation if it can be fixed or needs to be replaced. Rated 5 out of 5 by Groucho from This compactor compresses really well! I have been compacting household trash for 6 days now, and... This compactor compresses really well! I have been compacting household trash for 6 days now, and it is still not completely full. It was easy to install and came undamaged and in reasonable time. Well done HD! Rated 1 out of 5 by JimM from First one came with the door crooked. Called Maytag and they said cannot fix , return it. Second ... First one came with the door crooked. Called Maytag and they said cannot fix , return it. Second one came, door is more crooked, returned. What a pain and waste of time waiting over a month. Seriously hard to believe the door could not be adjusted somehow but I could not see how and Maytag said cannot be done?! ?